This review has admittedly been a rather difficult one to write. It’s always easy to write about a band that invokes strong emotions, either positive or negative. That’s not to say that this does not evoke any sort of response from me, because it certainly does. However, I have found trouble interpreting and critiquing what I hear not necessarily because of complexity, but rather one quite significant factor, but first a brief history. WHITE WIZZARD was formed in 2007 and has released two well-publicized EPs in the past two years. Three founding members left a short while ago and went on to form the band HOLY GRAIL. This is their first full-length album. 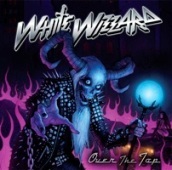 WHITE WIZZARD’s sound can easily be described as 80’s Power Metal. You can take any straight-forward Heavy Metal band from the 80’s, remove any semblance of originality, and you have WHITE WIZZARD. However, despite the lack of innovation, most of the music itself is very enjoyable. The songs are well-written, but basic and straightforward. There is decent guitar-work and riffs, but nothing amazing. Songs like the title track and "Live Free Or Die" are enjoyable enough, but sound oddly familiar. One has to wonder the staying power of many of these songs because of their simplicity and predictability. The main dilemma that I referenced earlier is this: how does one rate something like this album? I would be lying if I said that I didn’t enjoy "Over the Top", but the lack of innovation is too blatant to completely ignore. I’ve decided, however, to mostly overlook the unoriginality in my rating because of how pleasurable much of this is: there are a few fillers in the second half, but the album ends nicely with the song "White Wizzard". As mentioned before, the staying power of these songs is questionable. What good is an album where the listener is tired of it after 5 months? Still, "Over the Top" is enjoyable enough and as long as the similarity to many other bands from 25 years ago is not a problem, this is definitely worthwhile.